The Fleischman fragment, purchased from Fritz Bürki, had been included in the Getty's August 2007 agreement with Italy (as J. Paul Getty Museum inv. no. 96.AG.171). This announcement led to my speculation (with additional information, "From Malibu to Rome: implications for Shelby White") about the piece still in the possession of Shelby White. ... from the same room, as is catalogue number 125. Passion no. 125, "Vignettes of Cityscapes", remains in the J. Paul Getty Museum (inv. no. 96.AG.170) and did not form part of the 2007 agreement. in dimensions, subject matter, and condition, in [Paolo Giorgio] Ferri's words, it "would appear to be a twin to another fresco" seized in Geneva from [Giacomo] Medici. The ex-Fleischman fragment with the mask of Herakles is now on display in Rome ("Nostoi: Capolavori ritrovati"), and the Shelby White piece is likely to join it. Which dealer supplied it? Was it Bürki (as for the Fleischman piece)? Or were dismembered wall-painting fragments distributed round a network of dealers as P. Watson and C. Todeschini have demonstrated for fragments of Greek figure-decorated pottery? 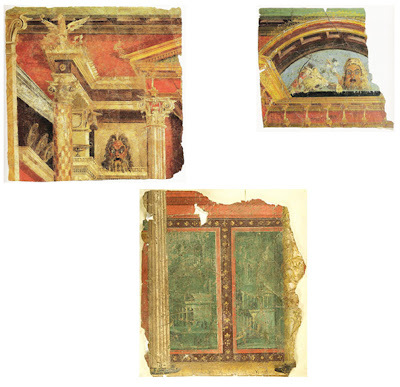 Will the J. Paul Getty Museum now make a generous and gracious gesture to return the second Fleischman fragment to Italy so that the pieces can be viewed together? Michael Brand, the director of the Getty, has recently expressed his views about the return of antiquities to Italy, but he would understand that the intention of the original ancient artist was for the fragments to be displayed and seen together. Now is the time for the fragments to be reunited. The arrangement of the fragments has been created by David Gill and is intended to give an impression of the original design. It is not an accurate reconstruction though the fragments are at the same approximate scale. As a curator at the Metropolitan Museum of Art from 1981-87, I helped to cultivate the support of two couples whose personal collections of classical antiquities became among the world's foremost: Leon Levy and Shelby White, and Lawrence and Barbara Fleischman. In neither case did I suspect then or now any malevolent intent on the part of these couples in pursuing objects of great quality. On the contrary, I knew them to be drawn to the remarkable breadth of the classical imagination, and by obtaining works of consummate beauty, they were proud to share their commitment with others. I wrote entries in the catalogues of their respective collections, long after leaving the Metropolitan, out of a sense that the works illustrated in those publications were better off known than suppressed. I maintain that position to this day: forswearing the publication of antiquities lacking comprehensive provenance penalises the works and their makers, and does no service to any potential claimants.